Greenoge is the 824th highest place in Ireland. Greenoge is the second most northerly summit and also the second most easterly in the Blackstairs Mountains area. Picture from madfrankie : The view from Greenoge: Mount Leinster on left, Slievebawn on right. Picture: The view from Greenoge: Mount Leinster on left, Slievebawn on right. From Croaghaun we continued east on pleasant forest tracks for some 3km. Rather than take the track that contours round Greenoge to the NE, we followed the forest's edge (which abuts high farmland) towards the wind turbines looming on the skyline. 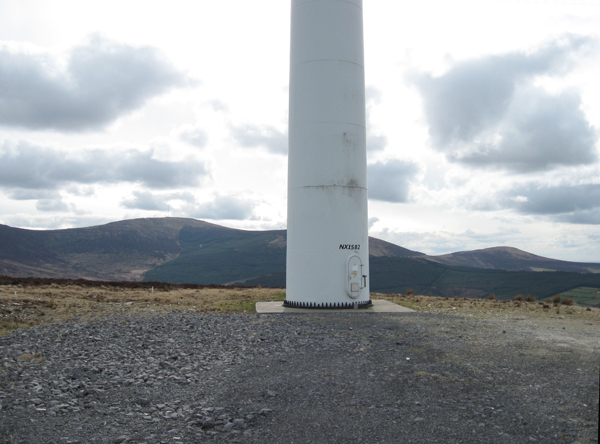 Greenoge is a flattish top, completely dominated by the 5 or 6 wind turbines at its summit. Despite the intrusive presence of all this stuff, there are fine views to be had, notably the impressive bulk of Mount Leinster, a short distance south.